When we started Pacific Reentry Career Services, one of our goals was to be advocates for fair chance hiring so we could help open up job opportunities for the formerly incarcerated. We held our first Fair Chance Hiring Summit back in June. Out of conversations at that summit, we realized there was a need for summits that focus on specific populations within the reentry community, which is why our November summit focused on the employment challenges faced by formerly incarcerated veterans. Cory Vigil shares his own story of being a formerly incarcerated veteran. Stephanie Hammerwold, Pacific Reentry Career Services Executive Director, started things off at the November summit with an overview of fair chance hiring and the challenges faced by formerly incarcerated veteran. Hammerwold also mentioned that employers can benefit form the Work Opportunity Tax Credit (WOTC) when hiring veterans, the formerly incarcerated and other hard-to-place job seekers. Next, Cory Vigil from the Working Wardrobes VetNet program. Vigil shared his own story about being a formerly incarcerated veteran and talked about the value of support services in helping formerly incarcerated veterans rebuild their lives. Vigil was also part of a panel with Frank Fletcher and Agent Raj Talwar. Fletcher is the Local Veterans Employment Representative at the Santa Ana Cluster of the California Employment Development Department, and Talwar is a Parole Agent Supervisor with the California Department of Corrections and Rehabilitation. The panel discussed the challenges faced by the formerly incarcerated veterans they work with and also explained why employers benefit when they hire this population. Veterans in general have strong teamwork skills and a good work ethic. When an employer hires a veteran, they are getting someone who is organized and disciplined. Just because a veteran has experienced incarceration, it does not mean that they have lost these abilities. By providing the necessary support services and opening up job opportunities, we help grow this skill set while also giving a formerly incarcerated veteran the chance at a stable income and meaningful work, which are important steps toward reentry success. After a group discussion about formerly incarcerated veterans and fair chance hiring, Edward Clarke of Need4Bridges left attendees with some inspiring words. Clarke's organization mentors formerly incarcerated people as they rebuild their lives, and he underscored the importance of supporting this community if we are going to help reduce the chance that people will recidivate. This includes providing job opportunities. Thank you to everyone who attended and to the Orange County One-Stop Center in Irvine for hosting our event and to the Orange County Re-Entry Partnership (OCREP) for supporting all our events. We look forward to continuing to provide educational opportunities that raise awareness about fair chance hiring. Watch our blog and subscribe to our newsletter to be the first to find out about upcoming events. Thank you to Christopher Reeve Linares for the pictures included with this post. Stephanie Hammerwold looks on as Edward Clarke (left) and Frank Fletcher (center) listen in to what other attendees are sharing. When: Friday, November 17, 8:45-11 a.m.
We are pleased to announce that we will be holding our second Fair Chance Hiring Summit on Friday, November 17. The Orange County One-Stop Center in Irvine will once again be hosting our summit at their office. The November summit will focus on the employment challenges faced by formerly incarcerated veterans and discuss ways that employers can support them in achieving success. This event is designed for HR professionals, hiring managers and business owners. Attendees will leave with tips on implementing fair chance hiring policies in their workplace and learn about ways to engage with local service providers to provide employment to and support formerly incarcerated veterans in Orange County. A job can do a lot to help a formerly incarcerated veteran rebuild their lives, so it is important that employers do their part to help make this a reality. Our speakers will include Cory Vigil from the VetNet program at Working Wardrobes; Frank Fletcher, the Local Veterans Employment Representative at America's Job Center of California at the Santa Ana W/O/R/K Center; Raj Talwar, a supervisor in the Anaheim Parole Office; Stephanie Hammerwold of Pacific Reentry Career Services; and Edward Clarke, the founder of Need4Bridges. We are working on adding additional speakers to our lineup. This event would not be possible without the support of our friends at the Orange County Re-Entry Partnership (OCREP), Working Wardrobes, Need4Bridges and the Orange County One-Stop Center. 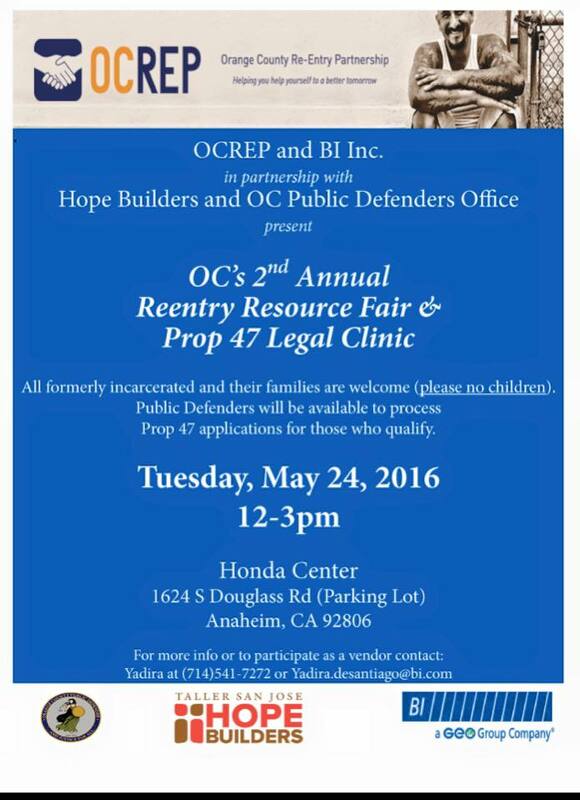 Orange County's 3rd Annual Re-Entry Resource Fair is scheduled for June 13 from 11 a.m. to 2 p.m. at the Honda Center in Anaheim. This free event is put on by the Orange County Re-Entry Partnership (OCREP) and other reentry service providers in Orange County. We are expecting nearly 60 vendors that cover a wide variety of services for formerly incarcerated people. Pacific Reentry Career Services will be on site to provide resume review and career coaching. Be sure to stop by our table to say hi and to learn how we can help you prepare for career success. This month's Orange County Reentry Partnership general meeting will focus on the benefits of hiring the formerly incarcerated. This is an excellent opportunity for employers, service providers and job seekers to learn more about this important topic. The meeting will include a panel discussion that covers best practices in using criminal backgrounds during the hiring process, special considerations when hiring the formerly incarcerated, success stories and more. The meeting will take place on Tuesday, September 13 from 3 to 5 p.m. at Working Wardrobes, which is located at 1851 Kettering St. in Irvine. See you there! Our friends at the Orange County Re-Entry Partnership (OCREP) and BI Inc. are partnering with Contra Costa County Office of Education Parole to put on a Reentry Resource Fair on Tuesday, May 24 from 12 to 3 p.m. at the Honda Center in Anaheim, CA. The purpose of the Reentry Resource Fair is to provide formerly incarcerated men and women with accessible information and connection to resources in Orange County. The focus is on addressing basic needs and facilitating reintegration back into our community. It is also an opportunity for these men and women to be welcomed home, providing hope for the future as the best way to prevent recidivism. Currently there are 52 providers confirmed, and there will be music and some great opportunity drawings. If you or a loved one were formerly incarcerated and are looking to find services to help you with employment, housing and more, be sure to attend the Reentry Resource Fair.